The mission of the General Education Program (GEP) at Winona State University is to provide a broad base of skills and knowledge to prepare students for informed, responsible citizenship in a changing world. Winona State University’s GEP includes ten goal areas and four additional graduation requirements. 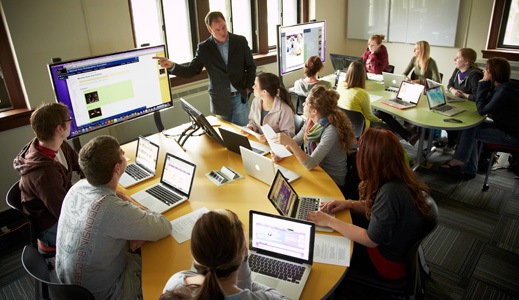 The Goal Areas are coordinated with the Minnesota Transfer Curriculum (MnTC). A minimum of 40 credits must be completed to fulfill the MnTC ten goal areas. Courses must be completed with a ‘D’ or better (Letter Grade Option) or ‘P’ (Pass/No Credit Option) to count in a Goal Area. A cumulative MnTC GPA of 2.0 is required to complete the entire 40-credit package. Important note: The WSU intensive course requirements and physical development/wellness requirements do not count toward the 40 credits required for graduation from the Minnesota transfer curriculum (MnTC). Often, but not always, writing, oral communication and mathematics-statistics or critical analysis intensive courses are included in a student's major program of study.